There is a never-ending need for new churches to be planted. From sea to shining sea, there is no community in America where we can hang a “mission accomplished” banner and stop planting churches. Wherever God is calling you to plant a church is a place where a church plant is needed. That said, church planting is difficult, treacherous, and not guaranteed to succeed. While the survivability rate is not nearly has tragic as some church planting statistics often report, as many as 3 or 4 in 10 churches will not survive past three years. While we may say these statistics aren’t that bad—you won’t agree with that statement if it’s your church plant that fails. Besides, our Great Commission purpose is too important. We should endeavor for every church plant to succeed. Church planting is hard, and just as there is an ideal profile for a church revitalization pastor, there is an ideal profile for a church planter. Some of these qualities are hard-wired, as would be evidenced in the DiSC or MBTI assessments. Some of the qualities are skills, which can be learned. The most important qualities, however, are character-related. These come through sanctification. Church planting is hard, and it will destroy those who are not properly equipped and prepared. This is the first of ten deadly church planting mistakes. Go to an assessment center and receive godly counsel to determine if you are ready. The process of planting a church is complicated. There are literally hundreds of tasks—some big, some small—that must be accomplished prior to launching a church. Not only is it possible for you to forget some, it’s likely that you may not even be aware of them all. Work alongside a trusted church planting coach who has walked in your shoes, who will hold you accountable, and who will encourage you in the process. Be certain that your coach isn’t just a nominal guide, but someone who is actively participating in planting your church from the outside—even if that means investing in a coach outside of your denomination or network. This is one of the church planting mistakes that’s easy to ignore, but would be to your detriment. Peter Wagner has famously quipped that “Planting new churches is the most effective evangelistic methodology known under heaven.” Because of this, church planters are often excited and feel as though they’re ready to launch after only a few weeks or few months of planning. This is among the most massive church planting mistakes. Babies take nine months to grow in the womb before being born, and church plants should take at least six months (but preferably nine to twelve months) to gestate. Launching too quickly means that many of the hundreds of pre-launch tasks were either hurried or skipped. You may not see the impact of rushing the process on day one, but you will feel it eventually. Be patient. Submit to the process. It will be worth it. There’s a popular book on church planting which features an image of a man on the cover holding a sickle in one hand, a Bible in the other, and a cross around his neck. It’s a masculine and powerful image. It’s also massively dangerous. The concept of the lone ranger church planter, going to conquer the gates of hell and reap a harvest of souls for Jesus is one of the most devastating church planting mistakes. The most successful church plants are the ones that are led by a team, and not by a single planter. While not every church plant can afford multiple paid staff from the beginning, there should be multiple staff pre-launch even if they are held by volunteers or part-time. Additionally, these should be leaders empowered with real responsibility, not just task-accomplishers. Churches that rely too heavily on one personality will rise and fall with that leader; it’s a dangerous and deadly path. You can launch too quickly, and you can launch too small. Often, these are connected. Sometimes, they are not. Which is why they are listed as separate church planting mistakes. Ideally, your launch team should be about 60-75 people. Less than 50, and your church will likely struggle long-term to grow. The reason for this is three-fold. First, launch team members fund ministry. At 75 people, much of the ministry is being funded just by your team. Secondly, you need those 75 people to be advocates for your church. Less than 50, and your church will struggle to get the word out that it exists. Finally, with less than 50 launch team members, you’ll likely struggle to sustain the necessary ministries. Launch team members are volunteers; without enough volunteers, your ministries will suffer. If the ministries suffer, people won’t want to come back. If people don’t come back, the church doesn’t grow. It’s a death spiral. Please, don’t launch too small. Take the time to build your launch team the right way. The church I helped plant in 2011 was 93% self-supporting on our first Sunday. I don’t recommend that. It was out of necessity for us, but hardly ideal. Alternatively, some church plants get used to the outside funding and don’t plan ahead enough for when those funds dry up. Be proactive. If the funding supports your church at the 75% level at launch, budget for it to cover 60% and stretch yourself to gain that 15% gap in offerings. Always budget in a forward-thinking way ahead of your projections so that you’re not caught flat-footed when the outside funding goes away. Church plants are exciting. People come because they want to check out something new and different. They may even stick around long-term because of the newness. But at some point, your church will cross that mysterious threshold where people stop coming just because it’s new. At this point, you’ll suffer consequence number seven of the deadly church planting mistakes: not having a solid assimilation plan. When excitement wears off, strategies begin to matter. Be intentional about this on the front end by clarifying your guest follow-up process. Church plants are magnets for toxic people or leaders from toxic situations. In any case, church plants must be cautious about installing local leaders too quickly. The governance of your church should be outside of the local congregation for three to five years. This gives ample time to identify and grow leaders organically who believe in the mission, values, and vision of your church rather than people who are looking to import their own. This is one of the church planting mistakes that people often resist and think it is being unbiblical to have non-local governance. Church planters want to trust their local leaders, but many church plants have suffered the consequences of relinquishing too much control to local lay leaders before the church was ready. This is not an excuse to have no accountability. Instead, this is an exhortation to fully empower experienced, trusted leaders that govern from without until those within are ready to lead in a healthy and godly way. Church plants often fall victim to this final mistake of the 10 deadly church planting mistakes. Church plants assume that because they had to strategically plan their launch that they don’t need to do strategic planning post-launch. This couldn’t be further from the truth. If it was done well, your mission and values shouldn’t need to shift after a few years. However, there’s a massive difference between a three-year-old church and a three-month-old church. It’s the process of shifting from church plant to church planted. Strategic planning is critical to long-term success and making this transition well. Too many church plants assume that they can continue to use the “we’re new” excuse for things that are dysfunctional. That excuse is valid, but has an expiration date. Don’t wait for a church plateau or decline before you engage in strategic planning. It comes more quickly than you would think. I recommend a thorough strategic planning process 18 months after launch. 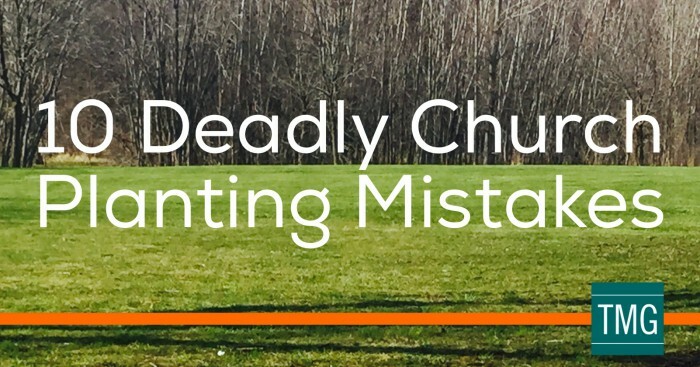 Don’t fall victim to one of these ten deadly church planting mistakes. They are avoidable. By being intentional about navigating around these church planting mistakes, planters give their new church its best chance at beating the statistics, and more importantly seeing a movement of the gospel arise in their community.